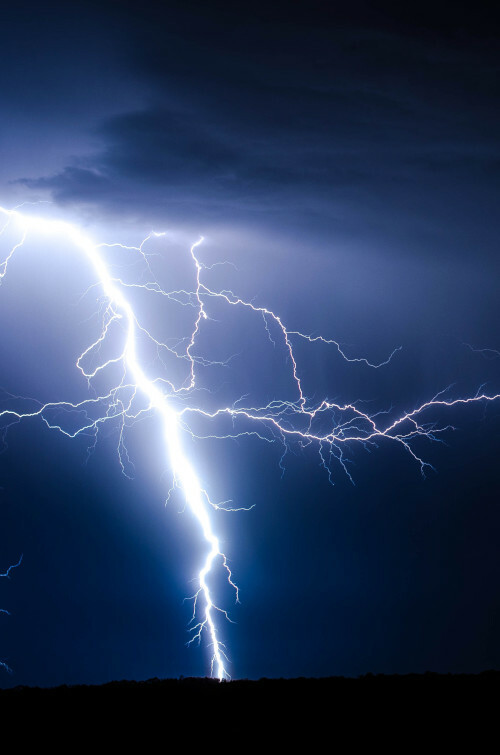 If you’re a homeowner, there’s a good chance that you will encounter a storm, and a generator will represent a good investment. You never really know what’s around the corner, and if you find yourself in a situation where you need backup, it’s always beneficial to be able to call upon a portable generator. If you’re looking for a generator for home use, you may have stumbled upon a range of options, including propane, gasoline, and diesel generators. Diesel is an excellent choice for home use because it offers better fuel efficiency. The best diesel generators will allow you to enjoy longer runtimes in tandem with lower running costs. Diesel generators are also safer than other options, as they are less volatile. If you’re interested in investing in a small diesel generator for your home, there are several factors that may influence your decision. With several brands and models on the market, it can be difficult to narrow down the options, especially if you don’t have in-depth knowledge of diesel inverter generators or experience of using generators that are designed for the home. This is where reviews come in handy. We have done the legwork for you, weeding out the generators that don’t quite live up to expectation and providing you with a guide to the best diesel generators out there. Cost is a factor that may affect the decision-making process, but it’s always wise to look for value for money over a low base price. Sometimes, the cheapest option is not the best, and reliability is key when buying a generator for your home. You may also wish to consider the manufacturer, the capacity and the wattage before you make your choice. Ideally suited to home use, the GENERAC 6846 diesel powered portable generator is a mid-range model, which represents excellent value for money. Engineered for industrial application, this is a generator that can cope with all conditions. A step up from cheaper, functional, no-frills models, this is an excellent choice for those keen to invest in a reliable generator, which is efficient, quiet, and durable. 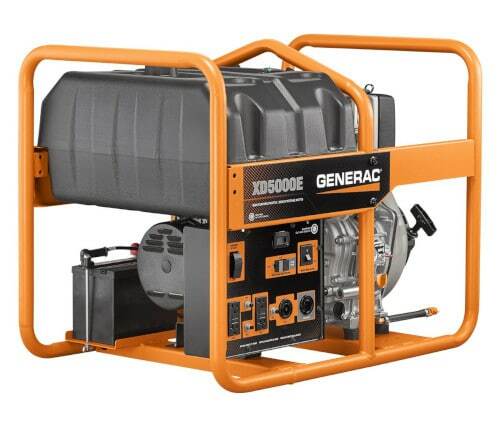 This GENERAC generator boasts a solid steel frame, which is built to last. Although strong and durable, the unit also has a lifting eye, which means that it is easy to transport. This diesel generator is powered by a Yanmar LW Series 435cc diesel engine, which utilizes direct fuel injection. The engine guarantees power and balance, providing smooth operation with minimal vibration. The engine is capable of generating 9.3HP at a speed of 3600 RPM. If you need to use a generator for a prolonged period of time, you can rely on the GENERAC 6864 portable diesel generator. This unit boasts a substantial 12-gallon fuel tank with a runtime of over 30 hours with a 50% load. Most of us are looking for ways to be more fuel-efficient and to cut the costs of powering our homes. 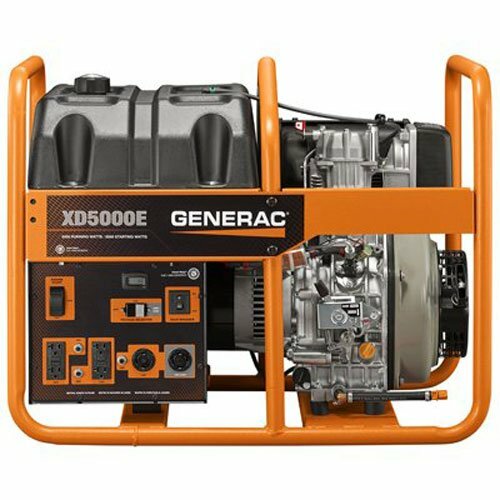 This GENERAC generator is incredibly efficient, offering around 6.75 kilowatt-hours per gallon of fuel. This compares favorably to gas generators, which usually offer a rate of below 5 kilowatt-hours per gallon. Who should buy this generator? The GENERAC 6864 portable diesel generator is ideal for homeowners who are looking for the strength, durability and power of an industrial generator with the portability, efficiency, and scale of a home generator. Although this isn’t the cheapest portable diesel generator on the market, you get a lot for your money. One of the most appealing options for those who don’t have a large budget, the DuroStar DS7000Q is designed for home use, as well as construction and agricultural application. This sturdy generator produces up to 6,000 watts of power and it can run for up to 12 hours at 50% load, making it ideal for emergency outages and unexpected power disruptions. It goes without saying that extended periods without power requires a generator capable of extended run times. Producing a peak wattage of 6,000 watts with a continual output of 5,500 watts, this is a dynamic, powerful portable generator. This generator has a relatively small fuel tank at just 3.83 gallons, but it does offer an impressive average run-time for its capacity. You can expect around 12 hours of power with a 50% load. The upshot of this is incredible figures when it comes to fuel efficiency. With this DuroStar generator, you’ll benefit from approximately 8.6 kilowatt-hours per gallon, which is far superior to any gas model on the market. There are three ways to start this generator, which makes life easy if you need power in a hurry. You can turn an electric key, engage the recoil start or take advantage of a handy remote control. This DuroStar generator may look fairly hefty and robust, but it boasts innovative noise-reduction features, including in-built sound-proofing and a muffler. Who should buy the DuroStar DS7000Q? 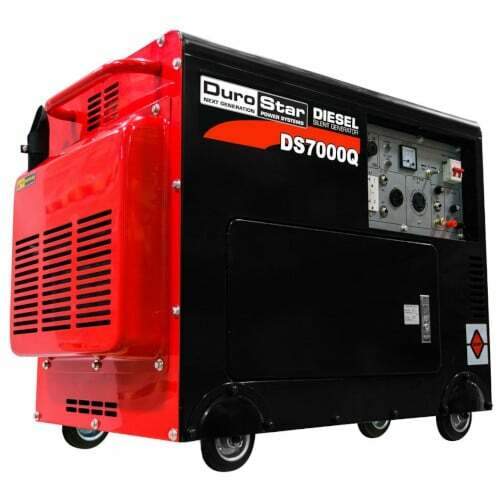 The DuroStar DS7000Q may not be the lowest-priced generator out there, but you’d be hard-pushed to find a product that offers better value for money. Cheaper than many other models, this portable diesel generator offers 12 hours of run time and incredible fuel-efficiency, which could save you a significant amount of money. Although this is a portable generator, it’s best suited to homeowners who don’t plan to travel around, as it weighs in excess of 300lbs. The price tag of the Boss Precision diesel-powered portable generator is likely to turn heads and attract attention. This portable diesel generator comes ready for home or commercial use, with a sleek powder-coated cabinet. One of the most affordable portable units recommended for home use, this generator ticks a lot of boxes for those who don’t want to spend a vast amount. This may look to be something of a beast of a generator, but it’s surprisingly quiet. 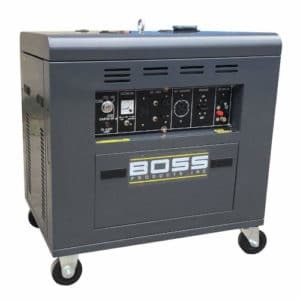 Boss Precision has clearly devoted a lot of effort to reducing noise and vibration levels, and this is part of a supreme line of generators. You shouldn’t expect silence, but you may be pleasantly surprised by the lack of noise, which Boss Precision claims to be 67 decibels. 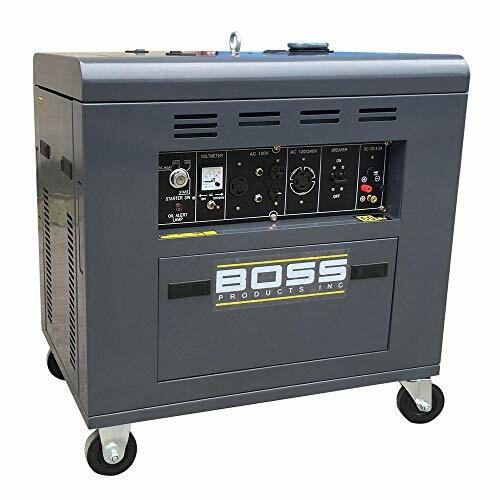 The Boss Precision diesel-powered portable generator is capable of producing a maximum output of 8,800 running watts, with a running output of 8,300 watts. It is run on a 4-stroke, 12HP single-cylinder engine. This generator is very easy to start and operate thanks to simple electric push start mechanisms, and the cabinet is heavy gauge steel & very solid. The Boss Precision Diesel generator will run for approximately 8.5 hours with a 50% load. It has a 3.9-gallon fuel tank, and a built-in fuek gauge and built-in hour meter, which makes it easy to see how much runtime remains. Who should buy the Boss Precision Portable Diesel Generator? 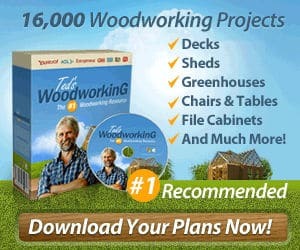 This generator is a great option for buyers who don’t want to spend a fortune. With lighter loads it can run for well over 10 hours, it’s very quiet, and operation is straightforward. At over 350 pounds, it’s not the easiest unit to move around. Thankfully Boss Precision includes the wheel kit with this generator, so it shouldn’t be a problem for those planning to use this portable diesel generator at home. 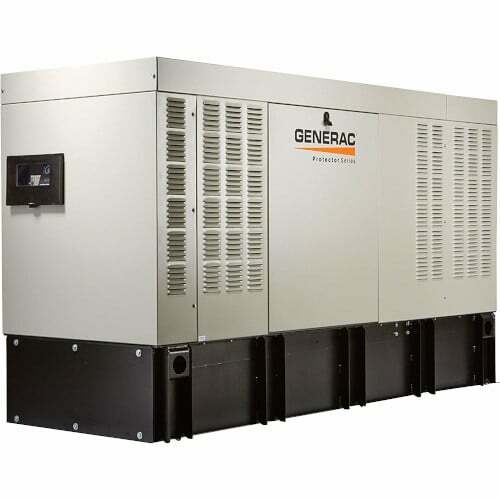 Part of GENERAC’s high-profile Protector Series of diesel generators, this standby generator is designed for residential and light commercial use. Providing backup power within seconds of an outage, this generator eliminates the stresses and strains of losing power in your home. The Protector Series boasts Code Ready, a pre-configured program, which is suitable for all building and coding zones. Featuring a giant 62-gallon fuel tank, this generator is capable of running for over 15 hours at full load. With a 50% load the generator can run for approximately 28 hours, but there is also an option to extend the tank for a runtime of over 2 days. Featuring state of the art noise-reducing technology, this giant generator runs at just 70 decibels. The GENERAC standby generator is incredibly powerful, producing up to 50kW. This Generac generator, which is part of the Protector Series, features Code Ready and Evolution Controller. Code Ready is a pre-customized program, which ensures that your generator is compatible with local building and coding requirements. Evolution Controller boasts a multi-lingual, vivid control panel with an LCD display and color-coded controls. Who should buy the GENERAC Protector Series standby generator? This generator is not suited to every homeowner. It’s much more expensive than smaller, less powerful, portable generators, and it has a range of features that simply won’t be required by those looking for an affordable diesel generator that can be called upon for a few hours when the power goes off. If you are in the market for a more advanced generator, which is packed with features and is capable of running for long periods of time and producing a huge amount of power, however, this generator could be the one for you. 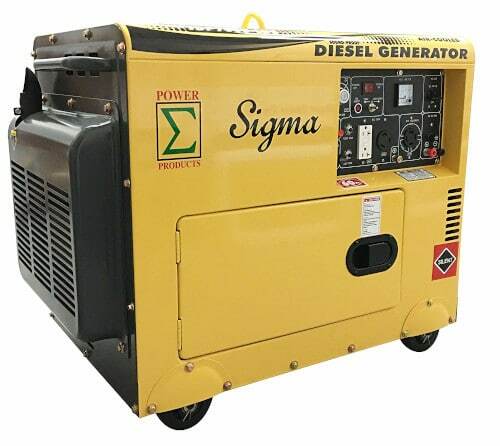 The POWER PRODUCTS SIGMA 7000W silent diesel generator is a powerful home generator, which offers the added bonus of extremely quiet operation. If you’re looking for a quiet, affordable diesel generator for your home, and you don’t want to spend more than around $1,500, this could be an appealing option to provide power for your home in the case of a power outage. As you can probably guess from the name of this product, this is a diesel generator that prides itself on working very quietly. With a noise level of just 70 decibels, you’ll barely notice that it’s running in the background. This diesel generator has a running output of 5,500 watts and a peak output of 7,000 watts. It is run by a 4-stroke, air-cooled engine. This generator doesn’t have the largest fuel tank at 15 liters, but it is capable of running for 8 hours at 50% load. It couldn’t be easier to fire up your generator with an electric start button. There’s also a low oil alert feature. 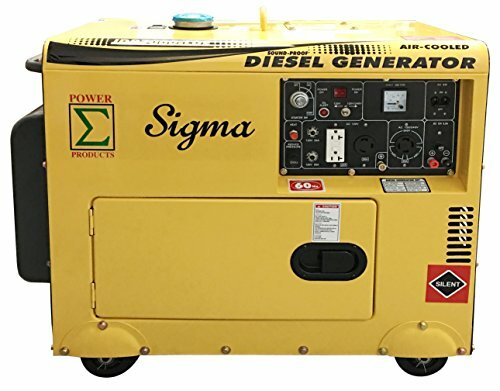 Who should buy the POWER PRODUCTS SIGMA 7000W generator? This relatively small diesel generator is ideal for buyers looking for a reliable, powerful generator for the home that isn’t going to break the bank. There’s a whole host of diesel generators out there, but you don’t have to spend hours trawling the net to find the best product for you. Hopefully, these reviews of the top diesel generators for home use will point you in the right direction.